Linneaus was born at "Isleham", Mathews County, Virginia, on 8 June 1822.1,2 Linneaus died on 14 June 1829 at age 7.1 His body was interred in June 1829 at Mathews County, Virginia, at Yeatman Plantation Cemetery. [S887] Source: E-mail from Becky Barnhardt (e-mail address) dated 09 January 2002. Albert Allman Yeatman , Sr. He married Elizabeth Todd.1 Mordecai died. Mordecai was born at 'Belle Ville', Gloucester County, Virginia. Major was born at Poquoson, York County, Virginia, on 23 October 1697. He married Diana Tabb circa 1719. Major died on 17 March 1756 at age 58. Rachel was born on 4 October 1732. She married Rev. Rosco Cole in 1749. She married Robert Bolling III in 1756.1 She married Charles Turnbull on 29 September 1759. Rachel died on 23 February 1767 at age 34. [S469] Source: R. Bolling Batte Papers -- Biographical Card Files, Bolling, R, beginning with card 49 of 159 (http://198.17.62.51/cgi-bin/drawerIII/disk8/CC/BA/005/B0054, The Library of Virginia, 800 E. Broad Street, Richmond, VA 23219-8000. Rev. died. Rev. was born in 1727. He married Rachel Robinson in 1749. Charles died. Charles was born. He married Rachel Robinson on 29 September 1759. [S492] Source: R. Bolling Batte Papers in posession of The Library of Virginia, Richmond, Virginia, biographical Card Files, Tabb, A, Card 33 of 136 (http://198.17.62.51/cgi-bin/drawerIII/disk8/CC/BA/035/T0463). [S125] He died of paralysis. Lucy was born on 2 April 1792. She married John Tabb on 13 November 1816.1 Lucy died on 24 June 1868 at age 76. [S339] Dallas County, Alabama, Marriages Appearing in Marriage Book I: 1818-1845. [S126] She died of Rheumatism. Christian was born on 12 July 1819. She married D. D. Stockton on 27 May 1851. Christian died on 30 December 1893 at age 74. D. was born. He married Christian Lewis Tabb on 27 May 1851. D. died on 7 October 1866. [S273] There were two sons and six daughters of this marriage. Sarah was born on 24 May 1827. Sarah died on 8 August 1844 at age 17. William was born on 19 December 1828. William died on 28 February 1853 at age 24. 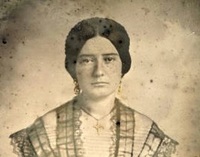 Matilda was born at Dallas, Alabama, on 23 April 1830. She married Dr. Edward Davis McDaniel on 12 May 1858.1 Matilda died on 5 May 1890 at Camden, Wilcox County, Alabama, at age 60. [S274] There were four sons and five daughters of this marriage.